A host of factors and failures have combined to outweigh Ennahda's successes in the transitional period, seeing its popularity shrink since its electoral victory in 2011. 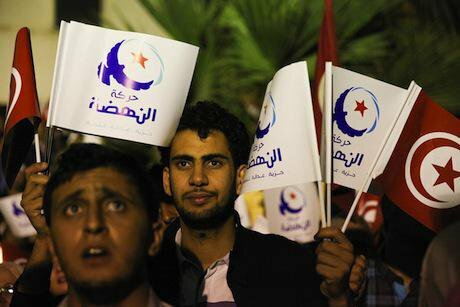 Ennahda leader concedes defeat in front of supporters in Tunisia. Demotix/Chedly Ben Ibrahim. All rights reserved. The recently announced results of the 2014 election unveiled a new political scene in Tunisia. Nida Tunis took the lead with 85 out of 217 members of parliament, followed by Ennahda. With shrinking popularity, the Islamist political party led by Rachid Ghannouchi ended up with 27 percent of the total number of popular votes and only 69 MPs. While it had assumed the leadership and was the most influential political force in the Troika coalition government, winning 90 seats in the constituent assembly in the watershed 2011 election, currently Ennahda plays the part of the main opposition party. A wide spectrum of factors acted in conjunction to bring about this decline of Islamist power in Tunisia. The symptoms of crisis were there. The winds of change were blowing across the country. But none of the Islamists, Ennahda leadership included, expected the radical departure taken by the Arab Spring. After decades of oppression, Ennahda was elected to office having won the confidence of the people. It was the first time in the history of Tunisia that Islamists came to power. That they had no experience whatsoever in running state affairs had its repercussions on the performance of government in a critical period of transition, marked as it was by increasing social protests, terrorist attacks, trade union pressures, and economic challenges. Ennahda prides itself on its success in setting up the first experiment in participatory governance by forging an alliance between Islamists and two secularist political parties: the Congress for the Republic and the Democratic Forum for Labour and Liberties. Ennahda, however, opted for a coalition based on partisan quotas and could not convert its electoral victory into developmental success, security, stability, or economic prosperity. The Troika ruled the country, especially during Hamadi Jebali’s premiership, with trembling hands, due to the absence of a clear strategy in the management of public affairs, the striking failure to live up to the expectations of the electorate, and the urgent needs of the masses. Even the history of its struggle for democracy could not absolve the Troika of its failure to take action. Tunisians elected the three parties of the Troika hoping to reap the fruits of the revolt for “employment, freedom, and national dignity”. What is true is that the Ennahda Movement safeguarded civil liberties. It did not control citizens via a hellish surveillance machinery, and did not disrupt the political activities of its political rivals. Ennahda indeed encouraged national dialogue between political contenders. It is also true that Ennahda contributed actively to the adoption of the first democratic and consensual Arab constitution that guarantees equality between men and women, freedom of expression, freedom of conscience, freedom of thought, the right of association, and the right to difference and political pluralism. As an Islamist political party, Ennahda was able to provide an example of a peaceful handover of power. However, its achievements cannot hide certain shortcomings. Ennahda failed spectacularly in finding procedural solutions to curb soaring prices, to cope with a decline in purchasing power, the proliferation of parallel economic activities in the black market or to tackle the problem of unemployment (15 percent). Lacking insight and experience, the Islamists fell into another trap. Ennahda leadership chose the wrong tack by encouraging the adoption of a pacifist policy with regard to Islamist extremists. Despite this, the ratification of the constitution led to a political split; when Ennahda rejected the inclusion of Sharia-related clauses in the new constitution, its Salafist allies reacted by withdrawing their support for Ennahda candidates in the recent parliamentary elections. Other Salafists, who had already challenged law and order by participating in bloodshed and acts of violence, continued their show of force, especially with the assassination of Chokri Belaid and Mohamed Brahmi, and threatened to bring the political transition to a dead end. The secular elites took advantage of Ennahda failings. They increased people’s fear of the Islamists, charging them with being a threat to society and to the project of modernisation that has been carried out since Tunisia’s independence. On another level, Ennahda dashed the hopes of oppressed and rebellious youth for social equality, for a just trial of the dictators and their associates, and for transitional justice. Priority was given to reconciliation over political accountability and the trial of the Ben Ali regime and its accomplices. Ennahda actually withdrew the Protection of the Revolution bill, opposed the political isolation law and rejected any reference to an age limit for presidential candidates in the electoral law. Such political decisions were coloured by Ghannouchi’s influence rather than by the consent of Ennahda’s institutions, its congress included. Ennahda did not seek advice from the elected representatives of its partisans, and most of its choices were overshadowed by the fear of the transfer of the Egyptian scenario to Tunisia. No wonder Ennahda sought consensus at any price. All this was not inconsequential. A strong sense of frustration struck young people in particular. The miscarriage of justice produced either reluctance to participate in the elections or a willingness to join one of the of small political parties claiming loyalty to the revolution, such as El Bina Party, El Wafa Party, and the Democratic Current, and Ennahda lost a large number of its supporters. Against this backdrop, symbolic figures in the old regime started to dominate the political scene. The dormant network of the so-called Democratic Group revived its powers, gathered its forces, and gained access to positions of influence in Nida Tunis and other constitutional parties. The Islamists naively thought that the more constitutional parties that were created, the weaker the Democratic Front would be. The Ennahda leadership hoped that in the elections Tunisians would cast out the accomplices of the old regime from political life forever. But that dream grew into a nightmare. Contrary to the Islamists’ expectations, the partisans of the Democratic Constitutional Rally (RCD), along with some leftists, resorted to tactical voting with one hope: to defeat Ennahda. They voted en masse in favour of Nida Tunis, which won the largest proportion of seats in parliament. Moreover, administrative bureaucracy and hubris overshadowed Ennahda’s decisions, leading many young people, Salafists and revolutionaries alike, to cut ties with Ennahda. Another factor that led to its spectacular failure is its use of mobilisation and popular rallies in the electoral campaign. These shows of force heightened the fear of Ennahda’s political rivals, who rallied their own supporters lest Islamists take over power in the country. More voters adopted a punitive approach to voting, generally against the Troika and specifically against Ennahda, because it failed to achieve most of what it pledged in its 2011 election manifesto. These factors combined engendered the decline of the political Islamists in Tunisia, but the downfall was precipitated by thousands of strikes and protests, as well as by the loyalties of the main trade union in the country. The Tunisian General Labour Union allied itself on more than one occasion with the opposition and declared a general strike three times whilst the Troika was in power. The climate of fear of terrorism for which Ennahda is held accountable and the search for safety, welfare, and stability added to all the reasons why Tunisians cast their votes for Nida Tunis and its leader. The media also played a key role in influencing voters, demonising Islamists and their allies in the coalition government. Ennahda suffered media attacks on a daily basis, under the pretext that its primary objective was the Islamisation of society. It was continually scapegoated despite the messages of reassurance its representatives in the constituent assembly sent to civil society, by means of their active contribution to the drafting of the constitution and to preserving the democratic climate in the country. Some of the blame for the stereotypical picture of Islamists must be borne by Ennahda, as it did not produce alternative professional media. Adding to the decline of Ennahda’s popularity is its representatives’ lacklustre performance in the media, prior to and during the election campaign. Nevertheless, the Ennahda Movement remains an important guarantor of the balance of powers in Tunisia’s political scene today, as well as a distinguished example of political Islam at work in the Arab world.